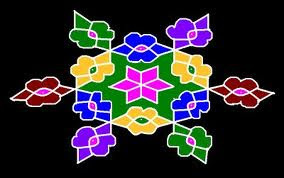 15 - 8 interlaced dots (Idukku Pulli) Kolam - Start with 15 dots in the center and stop at 8 by putting interlaced dots at both sides. Kamala, I am lakshmi. Your kolams are simply out of this world. Thanks for taking the time to draw such beautiful kolams & decorate them so perfectly!!! The colour combinations are spectacular. Thank you for visiting my site and your comments. It really encourage me to do more to spread this art to everyone.